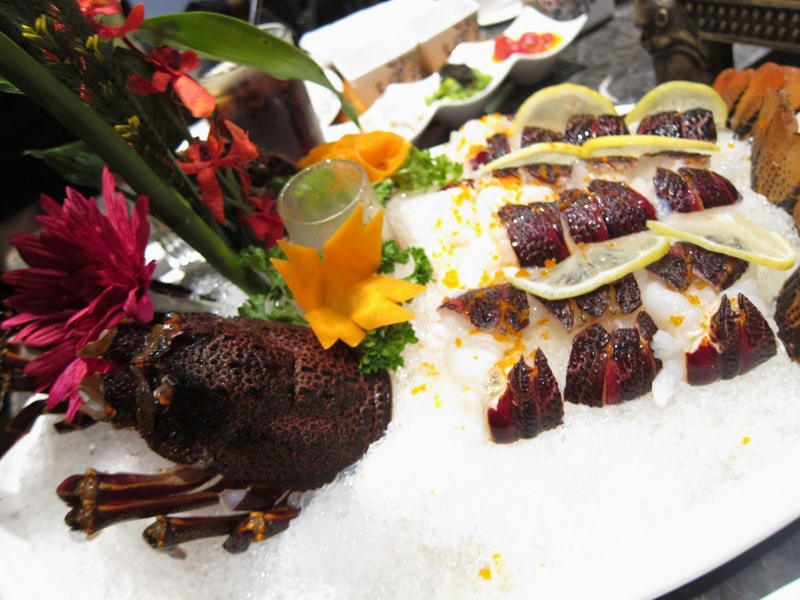 Cuising Master Hotpot is a new restaurant specializing in traditional hotpot savoured by the royalty only. Now we can enjoy what the royalty enjoyed in this new hotpot place along the river (its facing the river so its easy to spot)! I've always been a fan of hotpots (I lovveee soups~ yeahh~) and this is a brand new experience for me. There will be assistants to cook your food till optimum doneness and taste, while advising you the best way to savour it. Special dining space with a view of Singapore's famous night scene! We started off with fruits as the staff introduced that we have to eat fruits prior to other food during a meal, as the vitamins would absorb better as compared to starting off with food. P/s. I love their cutlery and crockery! Super well designed! This is a jue cup (爵杯) where kings and royalties use to drink (wine). The two mini mushroom looking things at the sides are to actually hold up the drinker's beard so it wouldn't enter the drink! WOW. We had wine from this cup and it was a cool experience hehehe. This is their double layer wine container! Ok nothing much to see here but I think this is another cool piece of crockery they have. Where can you find such stuff now? We had 2 different soup base - white one was chicken and brown one was mushroom. They are boiled over a long time and no msg or salt was added - only made from the best herbs and ingredients. Because it is really nutritious, they served the soup first. I used to like drinking soups from hotpots after stuff are cooked in it so as its more flavourful, but I was wrong! The manager said that it was better to drink it before food was cooked in it so it would be free of a certain substance (forgot what it was, but its no good for health!). Now I know! And you know! This was the mushroom soup base served with fish maw. Tasted herbal but not bitter. I like! This was the chicken soup base, served with scallops, baby abalone, fish maw, snail (conch? escargot? lol) and haisheng. It tastes milky sweet, and I had more servings of this soup cos it was awesome!! Fresh fish to be cooked infront of our eyes~ Its weird, but the fish was slightly sweet and really nice. Not fishy at all (you know, the fishy smell). There were prawns too but I don't eat prawns so no comments. Hahahaaha but I bet it was great too! Lobster! Super fresh and springy~ Picture credit to Mint! Our meal consisted of better kinds of mushrooms, Ba Chu & Morel mushrooms. Okay this should be in the front as its an appetizer, but I like posting pics according to the order I eat :P The ones in red are...... OMG. Cherry tomatoes in orange squash. This was the bomb! It was sooooo good!!!!!!!!!!!! Never had anything like this. The other appetizers are spicy peanuts and some veg. Yam & pork balls. I missed out on the shrimp balls cos I don't eat prawns so no comment on that either >.< But I bet it was good too! Chickennnnn. I like this chickennnnn~ Well marinated and doesn't lose its flavour in the soup. Beef! 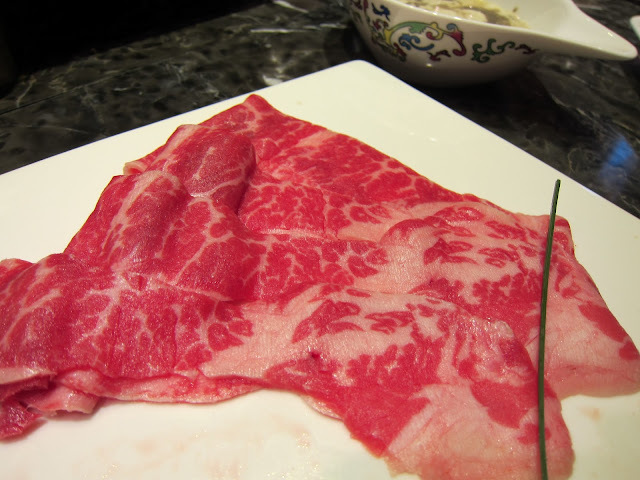 Thinly sliced for shabu-shabu style cooking. I'm not a fan of steaks, but I love beef like this! Havn't got a chance to try this that day, but its vegetarian! They have something for everyone there :) P/s. check out the cool bowl to secure chopsticks across it. This!!! Was da bomb too!!! This was the "special edition Buddha jump over the wall noodles". Most of us chosen to try this because it sounds good and DAYUMMM ITS SO GOOD. It is made with the chicken broth we had earlier on, together with signature ingredients from "Buddha jumps over the wall" dish (you know, like abalone, fish maw and stuff). P/s. check out the menu. You can order a bowl of this awesome noodles and it comes with the wonderful cherry tomatoes in orange squash side!!! Best tasting and most creative side dish ever hehehe. We were given smaller servings cos we had so much food earlier on, but it was just right to finish off the meal. The noodles here were replaced from the original homemade noodles to the "4 Happiness Noodles". 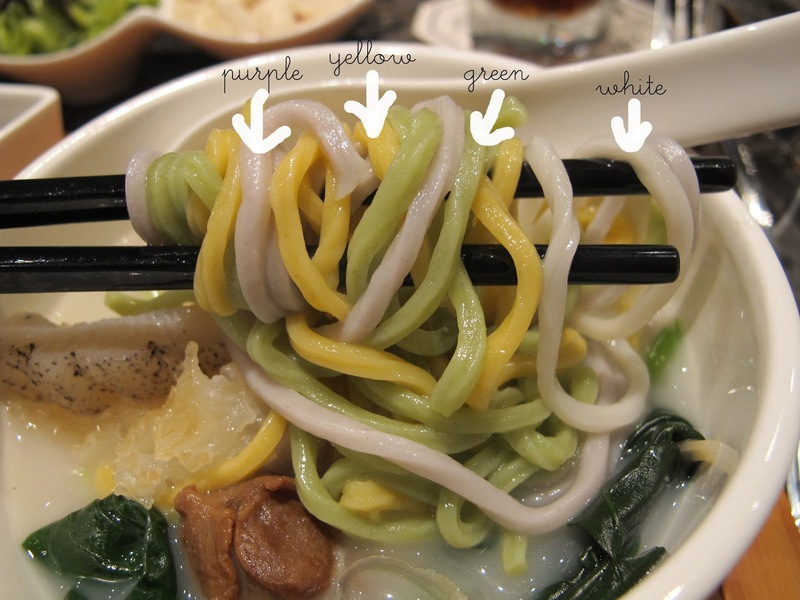 The noodles are coloured from veg juices and also fortified with the respective nutrients of the vegetables. Tastes reaaaalllyyy awesome with their special blend of fragrant chilli sauce. And check out the cute mug-bowl! I wanna have one at home too! A closer look at the different colours. Really special as I've never had such noodles. And we finished off with a tall drink each! Fruit sodas that weren't too sweet. Interior of the bar on the first floor. From the outside so you know which shop to look for! They have 3 stories to cater to different kinds of crowd, be it for a full course meal or just a drink. 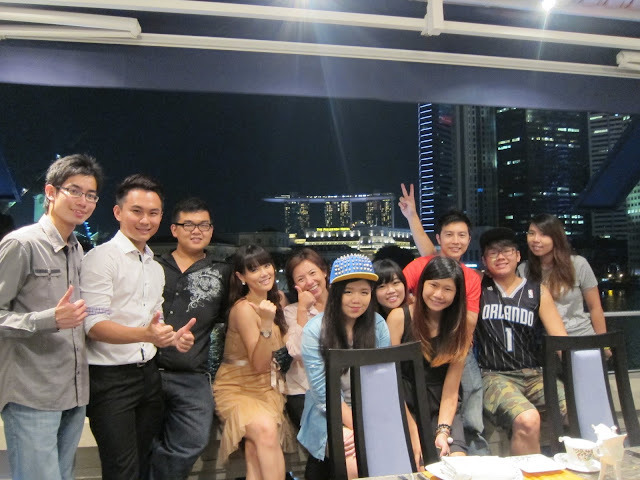 Do check out the coolest hotpot place in town now! Generally they have set meals (as hotpots are usually like ala carte or buffet style) and you can ensure that its filling and healthy. Health is what they keep in mind when coming up with the recipes! But ofcourse, they do not compromise on the taste. I've never had such an experience and I think its something that everyone should try. Healthy x Yummy! 5 stars for this dining experience! Check out Cuisine Master Hot Pot Facebook Page for more info and their latest updates! nice food, makes me want to try!